The Upminster & District Philharmonic Society was the forerunner of the Havering Concert Orchestra. Formed in 1936, it consisted of both an orchestra and operatic chorus. After the war, the group restarted but as a string only orchestra rehearsing at the Dury Falls School. In 1954 Eric Coles was appointed conductor. He had just left the BBC Concert Orchestra and was approached by Mr Cyril Cooke, then principal of the Hornchurch Evening Institute, with the object of forming an adult amateur orchestra. Wind instruments were added and the Hornchurch Orchestra was born. In 1965, when Hornchurch was absorbed into Havering Borough Council, the orchestra was again re-named with some of the original UPA members still playing an active part. Well known local artists such as Adrian Shepherd, Beryl Jones, Leonara Fane, Alfred Kendal and the internationally famous violinist Ralph Holmes all played with the orchestra during these years. 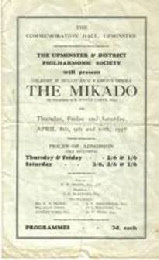 Below is the earliest programme from our archives dating back to 1937 and featuring the Upminster Philharmonic Society’s presentation of Gilbert and Sullivan’s Mikado. It was a three night run with tickets ranging from 1/6 to 3/6 and programmes at 3d each. The production took place at the Commemoration Hall Upminster (I believe this is now part of the current Trinity Church). The musical director was Fred Southgate, the Mikado of Japan was played by Herbert Parrish and Nanki-Poo his son by Basil Tucker. Patrons were asked to “kindly refrain from smoking during The First Act”. How times have changed. For a programme costing sixpence, the audience were treated to Mozart’s Piano Concerto where soloist Beryl Jones was described as “bringing the piece’s dark colouring into gravely beautiful relief”, as well as Schubert’s 3rd Symphony and works by Mendelssohn and Beethoven. Throughout the 60s the orchestra continued to flourish the under the stewardship of Eric Coles. Known as the Hornchurch Orchestra, performances were held at a variety of venues including Dury Falls School (where Havering Sixth Form college now stands), Romford County Technical School (was in Havering Drive), Hornchurch Grammar (now Emerson Park School) and Gaynes School in Upminster. During the Concert of May 1964, our ever versatile Chairman Joan Luck played three piano solos:- To the Spring, Clair de Lune and Andaluza. At the same concert, The Wanstead Trumpets performed a quartet of well-known operatic arrangements. In May 1965 the Orchestra performed with the Havering Singers, who still meet today. The programme included Hail Bright Abode from Wagner’s Tannhauser and Mozart’s Ave Verum. By 1965 the Orchestra had changed its name to the Havering Concert Orchestra. In November 1968 the Orchestra performed the Mendelssohn Violin Concerto with a young soloist by the name of Keith Gurry who had just graduated from the Royal Academy of Music to join the Royal Philharmonic Orchestra. Keith is still an active player in the area and today leads the nearby Woodford Symphony. Throughout the Sixties the entrance programme cost sixpence. By the advent of the 1970’s the cost had increased to 30p! By the start of the 70s the orchestra was performing at Abbs Cross Technical High School as well as Dury Falls School. Every concert was preceded by the National Anthem. In 1972, having been conductor since 1954, Eric Coles decided to retire from conducting the orchestra in order to pursue his love of chamber music. At his final concert, the orchestra performed Beethoven’s ‘Emperor’ piano concerto, Mozart’s Symphony No 40 and the Overture to Hansel and Gretel by Humperdinck. The conductor’s baton was now taken over by Robin Stone. A colourful character, Robin was a professor and examiner of piano at the London College of Music. As well as teaching, he composed several works, including a clarinet concerto, two piano quartets and a violin concerto at the age of 19. This latter work was performed by the orchestra in March 1974 with local soloist Glyn Davis. At the same concert, the orchestra also premiered a Concertino for two guitars and small orchestra by Professor Ian Parrott. By the end of the 1970’s, Robin Stone had moved on to be replaced by Robert Ferguson, ushering in a golden era for the HCO. In July 1998 Michael Axtell became conductor. In 2005 Bill Brooks, a leading light in the cello section, took over as conductor. He continued as conductor until 2018.